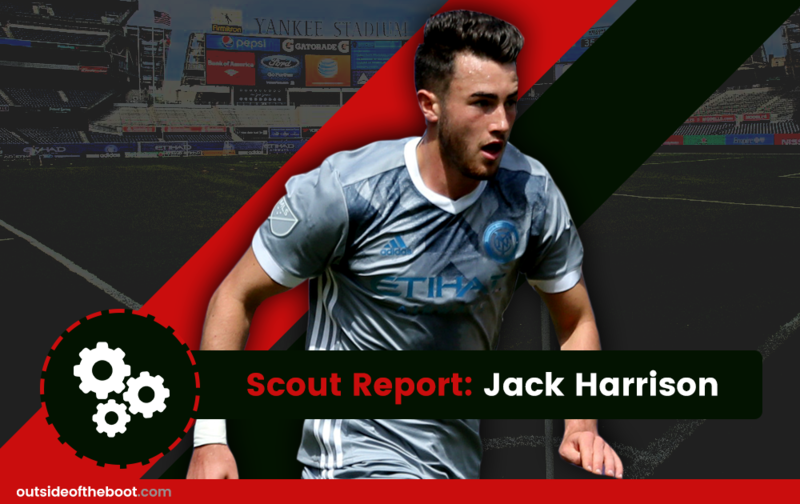 Josh Sippie takes a look at New York City FC’s Jack Harrison, one of the most promising attackers in MLS. The United States is starting to gain some legitimacy for international footballers as Major League Soccer continues to grow, both in terms of national interest and in terms of the stars that are attracted to play stateside. While once considered little more than a novelty, or and aging professional with just a year or two of viability left, the stars are currently getting younger with the likes of Kaká taking his talents stateside, alongside the seemingly ageless David Villa. New York City FC once boasted the likes of Villa, Frank Lampard and Andrea Pirlo, but they struggled to get off the ground. However, with the arrival their dynamic manager, former Arsenal invincible Patrick Vieira, the team has changed. This is most evident in terms of who their key players are and in terms of their domestic success; the two are most certainly related. Jack Harrison is one such young rising star that NYCFC is investing in to lead the team into the future. Born in Stoke-on-Trent on 20 November, 1996, Harrison was just seven years old when he was scooped up by the Manchester United academy. He remained with United for another seven years before he was faced with a decision that seems like it would have been an easy one to make for most young English stars: Stay with United or go to another United – the United States. Harrison is certainly aided by playing alongside Villa, as the young Englishman has struck up a fine partnership with the former Barcelona man, but it is the younger player whose importance continues to grow. Harrison is right to not regret his decision, although more decisions may be upcoming, as he is emerging on radars across the globe. Harrison plays on the wings for New York City Football Club, and it’s hard to imagine a better place for him, though he is capable of playing any attacking position, even up front. He is a workhorse, who rampages up and down his side of the pitch and beyond, never satisfied to sit and watch. He also offers superb pace and aggressiveness, an important asset in the MLS. There aren’t that many players out there who can look as comfortable with the ball at their feet as Jack Harrison. It seems to stick to his toe as he whittles his way through opposing defenses and makes it look shockingly easy for a 20-year-old. That said, his style points don’t stop with the fancy footwork. Once he puts himself in position, he is perfectly capable of slipping the ball past opposing keepers just as easily as he dribbled past the defenders to get there. Off of the ball, it’s more of the same with Harrison. He is always looking for space and tends to put himself in fantastic positions to poach rebounds or field longer passes from the likes of Pirlo or Maxi Moralez. Harrison’s biggest strength is his footwork. It is impossible to sit down when watching him dribble; there is too much excitement involved. There simply isn’t anything he can’t do with the ball at his feet; there’s no area he won’t probe into and nowhere the defender can rule out as a potential lane of passage. High, low, through or around, the ball can go anywhere when Harrison is calling the shots, and he will be in total control of it. The entire pitch is his playground with the ball in front of him. His effort ranks as his second greatest strength. There have been numerous times where his hard work and anticipation has landed him an errant ball from an opponent’s lazy spot of possession and that’s all the window he needs to make them pay. On the counter, he is deadly, as he is just as capable of taking the ball all the way home himself or dropping it off to a team mate (usually Villa) and letting them have an easy goal. Harrison’s pace is such a point of strength too, as it pairs so well with his previous two strengths. Without that pace, he wouldn’t be as effective on the counter and his dribbles wouldn’t grant him quite as much space as they currently do. Since Harrison is so talented, I have gone this far without even getting a chance to mention his passing, but there is nothing lacking there either. His crossing is quality from the wings and he is capable of some impressive passing in close quarters as well. There is only one area where Harrison might get slated as being sub-par, and that is in taking care of the ball. As is the case with any ambitious, eager attacker, there is often a tendency to get a bit over-eager and push too hard when keeping it simple would be the more advisable option. However, it’s hard to fault him much, as this weakness is simply a byproduct of his aggressiveness, and it is absolutely something one would take rather than having him change his style of play to be more protective in possession. Still, a bit more experience will solidify his decision-making on the ball; the massive potential that Harrison has to be something really special is patent and will continue to improve.